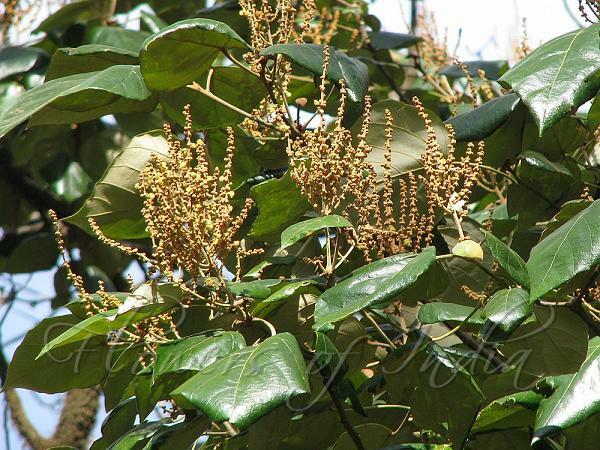 Rusty Kamala is a tree up to 12 m tall. Bark is brown, warty, blaze cream. Young branchlets are flat. Leaves are simple, alternate, spirally arranged, stalk 3-12.5 cm long, swollen at both ends. Leaf blade is 8-25 x 6.5-20 cm, broadly ovate to circular, tip pointed to long-pointed. The stalk is attached to the leaf in the middle (peltate). Leaves are usually entire or trilobed when young, leathery, densely white velvety beneath, 3-5 nerved at base. Flowers are unisexual, dioecious, in axillary or terminal panicles, velvety. Capsule is spherical, covered with soft wooly spines, seeds 6. Rusty Kamala is found in India, Sri Lanka, Myanmar. In India it is found in the Western Ghats through out.